Open ZoteroBib, https://zbib.org/ , in one browser tab. In another browser tab, open a description of the item you are interested in (or the full text of the item). If you cannot find one of the above identifiers, copy/type the title of the item into the ZoteroBib search bar. ZoteroBib says that you can copy an item's web page address (page URL) into the ZotroBib search bar. HOWEVER, the page URLs DO NOT WORK in ZoteroBib if you are using EMU Library search tools to discover items for your bibliogrpahy, for example, if you are searching in the Esearch search box on the Library home page, or any ProQuest or EBSCOhost database (e.g., PSYCinfo, ERIC, CINAHL). If ZoteroBib does not generate a bibliographic entry from the information you put in the ZoteroBib search bar, you can click the Manual Entry button below the search bar to type descriptive information about the item manually. You might need to add or change a few fields after adding an item. Click the Edit button (or the item in the bibliography) to make manual changes. Click the Remove icon (X) next to a bibliography entry to delete it. To start a new bibliography, click Delete All to remove all entries. Your bibliography is stored in your browser’s local storage by default. You can close the page and return to it later, and your bibliography will still be there— no need to worry about saving your data or logging in. Note that if you’re using private/incognito mode in your browser, your bibliography will be deleted as soon as you close the window, so if you choose to use private browsing be sure to periodically use the Link to this version Create box (see below) and save the URL. In ZoteroBbib, in the Bibliography panel, click the blue style bar to select one of the default bibliographic styles or click the link saying '9,000+ other styles available...' to search for the bibliographic style you need. Title case: George Washington: A Hero for American Students? ZoteroBib conversion: George washington: a hero for american students? Sentence case: George Washington: A hero for American students? APA style specifies that if periodicals are paginated across an entire volume, e.g., starting on page 1 in January and ending on page 1,000 in December, then the ISSUE NUMBER should NOT be included in the reference citation. If a periodical starts each issue with page 1, then the issue number should be included in the reference citation. Many search tools include an issue number if there is one, so when the information is pulled into ZoteroBib, the issue number will be included. Since most academic journals are paginated across the entire volume you will often have to manually delete the issue number from the ZoteroBib reference citation (see Edit Bibliography Items above). click on the citation in ZoteroBib and delete Issue 4. To rename your bibliography, just click its title (default is Bibliography). A title can be useful if you’re switching between multiple projects or sharing a bibliography with others. enter the relevant page range or section of the source that you’re citing, and click Copy Citation or Copy Note. You can then paste the citation into your paper. 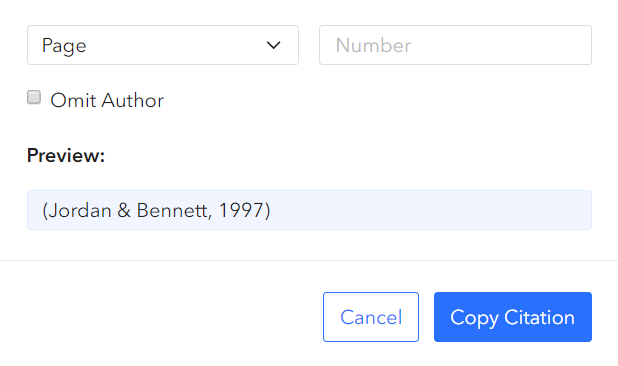 For styles such as APA and MLA, if you incorporate an author’s name into a sentence (“As Smith writes…”), you can use the “Omit Author” option to include only a date and/or page number in the parenthetical citation (“(2015, pp. 12–13)”). When you’re done, you can use the Export panel to copy a formatted bibliography to the clipboard and paste it into your document. You can also export HTML to add to a webpage, an RTF document to open in a word processor, or a RIS or BibTeX file to import into a reference manager. 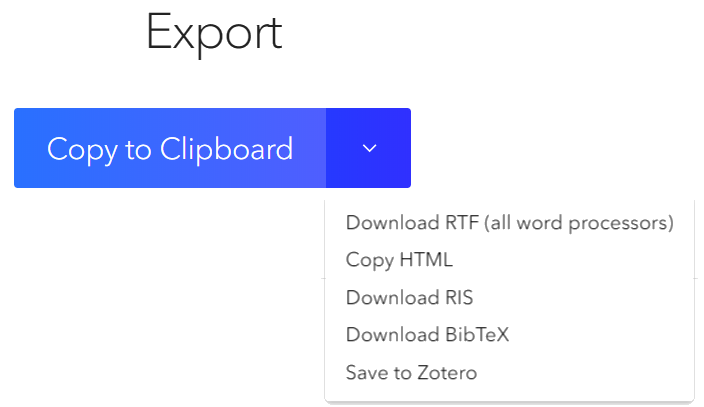 If you want to work on your ZoteroBib bibliography on another computer or share your bibliography with someone else, you can click the Link to this version Create box in ZoteroBib.